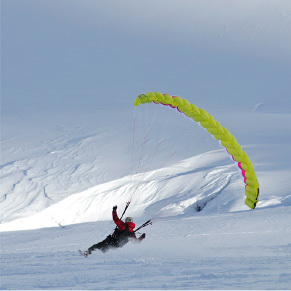 Speed riding is a mix between skiing and paragliding. The activity was born in the mid-2000s, driven by a few board sports enthusiasts : Fred Fugen, Franck Coupat, François Bon, Antoine Montant, to cite but a few. All you need is a pair of skis, a tiny sail, and 100% adrenalin…Speed riding opens up a new dimension in skiing, which is 3D. You can take off and then come back down to carve nice curves : you have an infinity of possibilities when you go speed-riding. 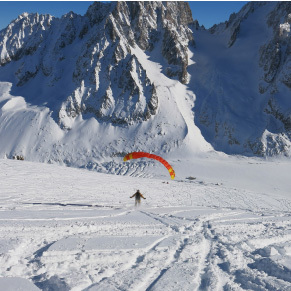 Starting in 2007, the French hang-gliding federation (Fédération française de vol libre FFVL) has coordinated the activity, certified specific areas and put into place training courses for instructors. 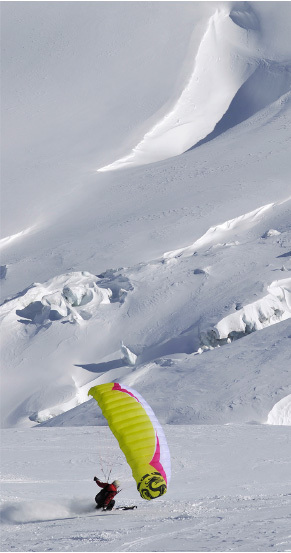 Speed riding is taking off ! 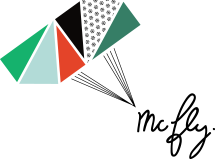 There are no specific hang gliding prerequisites (paragliding or skydiving). However you have to be a good skier, on all types of snows, and all types of terrains. We only ride off-piste where the snow has not been plowed, and where skiing has to be a second nature. I offer a wide array of activities according to what suits you best : one-day discovery outings, riding in the high mountains, or even full trips. I can supervise 4 persons per day maximum. I like to share my passion in a fun, safe, and friendly atmosphere. If you want to go further in the activity, you must have bring a medical certificate that specifies you can practice that sport, and take out a civil liability insurance policy with the FFVL that covers your responsibility in case of an accident. 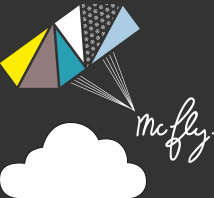 Contact me, and I will help you choose the contract that corresponds best to you. 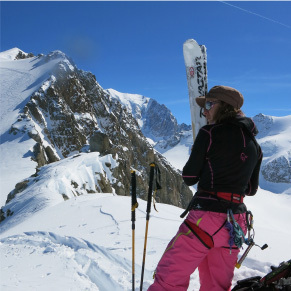 What I like best is skiing off piste, discovering new lines after skinning up or climbing up using ice axes. That is what I want to share with you. We can go and discover new wild slopes under the supervision of a mountain guide, mixing ski touring, alpinism and speed-riding. 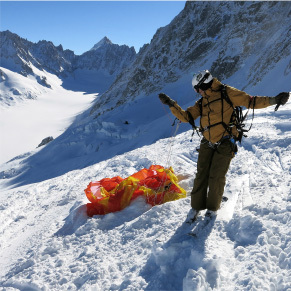 The Mont Blanc massif and the mountains around offer a large number of possibilities : the Passon pass, the Amethystes glacier, the South Face of the Mont Blanc, the Tour Noir col, or the Aiguilles Rouges to name but a few. Let me know what you wish to do and we will discuss the best options according to your level and the weather and snow conditions. Private courses, 4 persons maximum. I provide all the gear :LEVEL sails which are adapted to your weight and Fusion harness with back protection, radios and earpieces. All you have to bring is: a pair of free-ride skis, a ski helmet and goggles. Make sure you bring water, snacks, and sunscreen. What is not included in the price is : ski lifts, aerial liability, and nights in the huts when we go up in the mountains. Appointment : We will meet in the morning at the bottom of the pistes or directly at your hotel in order to take care of the last details in terms of gear, insurance, and ski pass. And then we will all take the lifts up to the designated areas. Discovery of Les Houches: Only possible when conditions allow it.